Spiral Zipper is a novel linear actuator developed in Modlab. The fundamental concept is that a long thin strip of material is generally flexible along its length but stiff along its height. If we pattern the upper and lower edges of the strip , winding this strip in a spiral will create a rigid load-carrying tube. To turn this concept into a linear actuator we created a 3D printed alignment block that guides an unmeshed length of band into a helix and then pushes the teeth of the band together (or pulls them apart) at the proper moment. The idea again is very similar to the fly of a regular zipper which guides, pushes, and pulls the zipper teeth of your jacket into the proper place at the proper time. The difference is that the zipper is now travelling in a spiral which leads the meshing to occur normal to the flat of the band rather than to its edge. The mechanism possesses a variety of favorable attributes. One valuable detail is that we can achieve incredibly high extension ratios. The system can be as short as twice the height of a band when fully retracted (usually about 6-12 inches depending on the diameter of the column) and can be extended as far as the longest strip of band available. In one test we created a band with a 15:1 extension ratio. 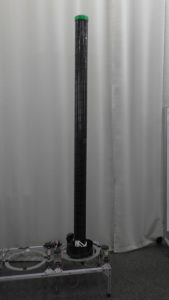 In this instance, the shortest retracted length was 6 inches and formed a column of 7’ 6’’ at full extension. Higher extension ratios are possible. Such high extension ratios mean that this system can possess a very large workspace but retract into an incredibly small profile when not in use. Another useful trait is its high-strength to weight ratio. 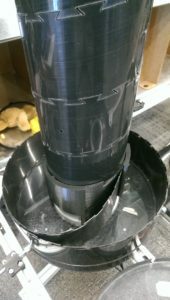 Under testing we found that a 4.5″ diameter column using a 0.032” thick band could support 300 lbs of compressive load when extended to a height of 6’. What is remarkable is the fact that this maximum load is considerably lower than what the theoretical maximum load is. We believe that with additional effort we can attain yield loads of 1000 lbs or more. These loading results are especially impressive given the third interesting attribute of the system: its weight. The weight of the band used to achieve the above load was only about 1.5 lbs. Finally, the system is incredibly low cost. The materials we’ve used thus far are ABS plastic and spring steel, both of which are commoditized and inexpensive. With the proper setup, it would be straightforward to set up a system to produce thousands of feet of band quickly and efficiently. 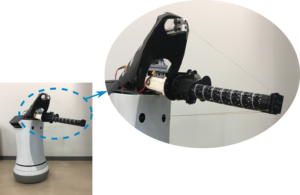 With this concept we have been exploring various robotics applications where lightweight strong manipulators with large variable workspaces would be useful. In one project we mounted the spiral zipper mechanism to a 2 axis gimbal. A trio of tethers then pulls the column in different directions. 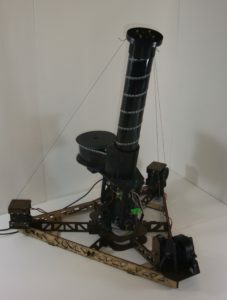 The resulting 3 DOF manipulator will eventually be mounted to a drone being developed by Army Research Lab(ARL) allowing the drone to interact with its environment in novel ways. In a similar project we are taking the same style arm with a single axis gimbal and mounting it to a Savioke robot. The system will then be deployed into a nursing home to aid elders in walking, picking things up off the floor, and carrying items for them. In a third more ambitious project we’re hoping to create a moving reconfigurable truss structure out of a set of spiral zipper columns. The truss will be able to move itself to a damaged structure and expand itself to shore the wall. You can learn more about that particular project here. 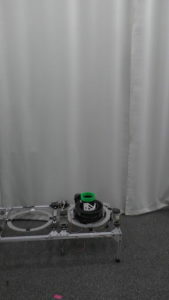 F. Collins and M. Yim, “Design of a spherical robot arm with the spiral zipper prismatic joint,” in 2016 ieee international conference on robotics and automation (icra), 2016. Dec 07, 2017 | Filed under Cable Robots, Service Robots.